There is a moment in Emma Rice’s adaption of Wise Children where a hand drawn animation is projected onto the side of a caravan. Fine-lined pigeons fly through a brown butcher’s paper London, giving way to bright butterflies flapping over the Thames as identical twin pensioners Dora (Gareth Snook) and Nora Chance (Etta Murfitt) sing of their origins on the wrong side of the tracks/river. The images flicker in and out, not like the clickety run of a Pathe news film but with a hesitance. I was quick to correct my plus one Ed’s disappointment that the technology had failed. I trailed off as I realised Ed had stopped listening ages ago and was looking hopefully over my shoulder at the free wine. The next day I received a very nice email from Wise Children’s PR apologising for the glitch and with a link to the full, completely steady animation. I lead my review with this not to highlight the unreliability of technology, nor to give Ed the satisfaction of being right, but because it seems a good metaphor for how Wise Children disrupts theatre rules. It doesn’t conform to any conventional narrative form or genre – is it a musical? (not really) kids show? (definitely not) a total fantasy? (no, there are a lot of very dark truths here). It pushes against what Maaike Bleeker refers in Visuality in the Theatre: The Locus of Looking (yes it’s one of those reviews sorry/not sorry): the idea of “theatre and reality as parallel constructions appealing to similar ways of looking”. In Wise Children, we are instead positioned as a very postmodern audience (yes, again, it’s one of those. Sorry.) who are “granted the freedom to see and give meaning at will”. It’s a story about impossible carnivalesque lives where every sensibility is inverted and, therefore a faltering projection seems entirely consistent with the constant shifting of where to look, what to trust and the meanings that should be given. Dora and Nora look back over their lives spent as song and dance chorus girls, at their loves, twin father figures and adventures along the way. It’s a complicated, bonkfest of a plot, full of Shakespearian levels of complex partner and parent-swapping. The phrase “Oh what a joy it is to sing and dance” rings through it, echoed in a mix of original songs and slightly sinister jukebox covers that add yet another surreal touch to the action. A throaty version of the jazz song ‘Is you is or is you ain’t my baby?’ becomes a torch song of doubtful paternity, delivered from beneath a Warhol-esque wig as three sets of twins (nay, four – if we consider Dora (Melissa James)and Nora’s (Omari Douglas) younger showgirl selves melting back into the chorus) seek out lost father-and-daughter bonds. The decision to cast the ‘twins’ across race and gender works in the absurd Carter/Rice universe. The connection between each pairing is not based on what they look like, but on the unbreakable thread that runs between them. Dora and Nora are two counterpoints on a pinwheel swirling through a ridiculous, if beautiful, theatrical life. The romanticism of the theatre is a strong theme, created through Vicki Mortimer’s design that gives particular significance to the small curtain flown in to represent the twins’ stage world. Peeping round it, sneaking lovers behind it – that curtain becomes the flimsy partition between the dazzle of a life lived in the spotlight and the graft and grit of what happens in the dark corners of backstage. Rice has something of a love affair with Angela Carter. She directed Nights at the Circus in 2006, and her new theatre company also bears the Wise Children name. It’s one that marries the innocence and charm of her work with something older and knowing. There is a poignancy that runs through Carter’s last novel, written after her diagnosis of terminal lung cancer. A feeling of looking back over the past, dusting off the moments that actually mattered (even if we didn’t realise at the time) and mounting them anew in paste and rhinestones. Rice’s production is one that rightly glitters with the childlike wonder and delight of Carter’s work (“Oh what a joy it is to sing and dance”) but never shies away from how wisdom is hard gained. 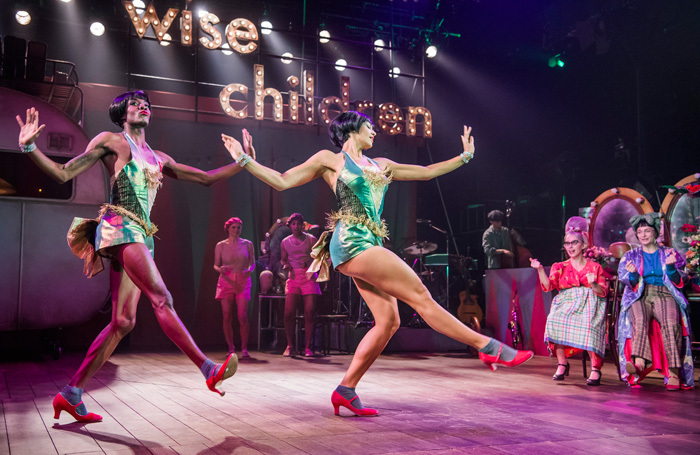 Wise Children is on at the Old Vic until 10th November. More info and tickets here.